The term ‘equilibrium’ is derived from two Latin words called “acqui” and “libra”. “Acqui” means equal and “libra” refers to balance. Hence, equilibrium means ‘equal balance’. The term ‘equilibrium’ is substantially used in physics. In physics, equilibrium refers to a state of balance. An object is considered to be in a state of equilibrium, when two opposing forces balance each other on the object under review. The importance of the equilibrium concept not just limits to physics. The application of the concept of equilibrium is vital in economics that makes some economists call economics as equilibrium economics. In economics, equilibrium denotes a state in which the two opposite forces are unable to influence each other. In simple words, equilibrium is a position in which no further change is possible. In figure 1(a), the ball is comfort at the base of the bowl. It remains in stable equilibrium. If interfered, the ball is going to rest at its original position again. In figure 1(b), the ball is located on a billiard table. It shows neutral equilibrium. If perturbed, the ball is going to find its balance at another new position. In figure 1(c), the ball is stabilized on top of the upturned bowl. It is basically in unstable equilibrium. If interrupted, the ball will certainly move down either side of the bowl and fails to get back to its original position. 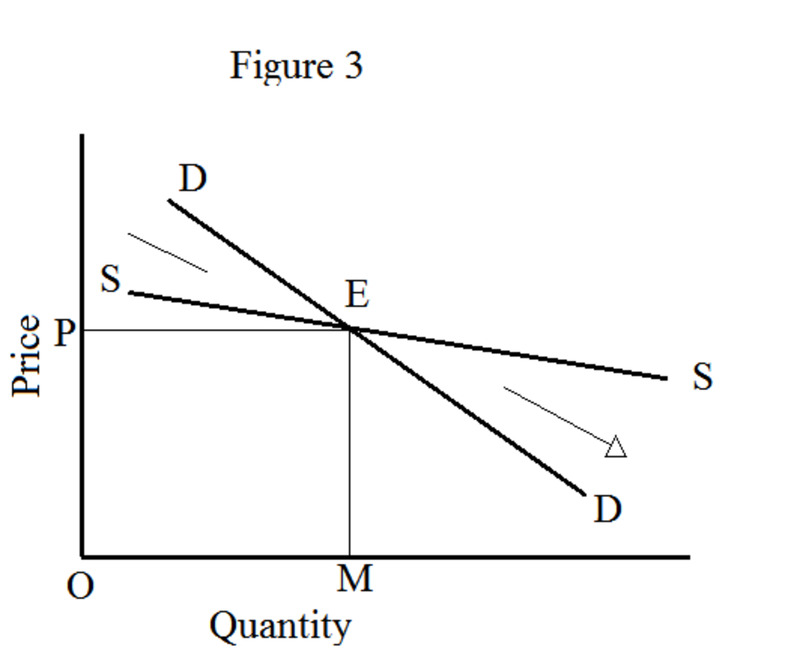 In figure 2, DD represents a negatively sloped demand curve and SS denotes a positively sloped supply curve. The equilibrium occurs at point E. At this point, the supply and demand are in balance; the equilibrium price OP and the equilibrium quantity OQ are determined. It is a classical example of stable equilibrium in economics. What happens at prices above equilibrium level? Let us assume that the market price is OP1. At this price, P1B is the quantity supplied while the quantity demanded is only P1A. Hence, quantity supplied is more than the quantity demanded. The surplus quantity in the market is to the extent of AB. This creates a downward pressure on price. The downward pressure applies until the price reaches the equilibrium level at which the quantity supplied equals the quantity demanded. What happens at prices below equilibrium level? In the diagram, let us consider the price OP2. At this price level, the quantity supplied is less than the quantity demanded. CE1 denotes the volume of shortage of commodity. Due to this excess demand, an upward pressure on the price applies. This upward pressure pushes up the price to the equilibrium level at which the quantity supplied equals the quantity demanded. 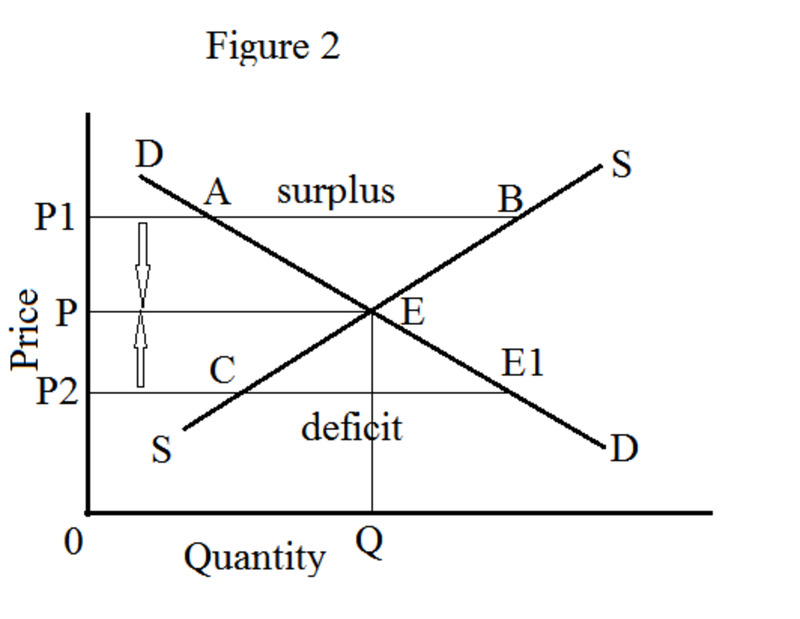 In supply and demand analysis, unstable equilibrium can occur at two occasions: (1) when there is a negatively sloped supply curve and (2) when there is a positively sloped demand curve. Unstable equilibrium occurs when there are negatively sloped demand curve, which is normal and a negatively sloped supply curve, which is a rare and exceptional case. This negatively sloping supply curve is possible when both increasing production and decreasing costs occur simultaneously due to various internal and external economies of scale enjoyed by the firm. 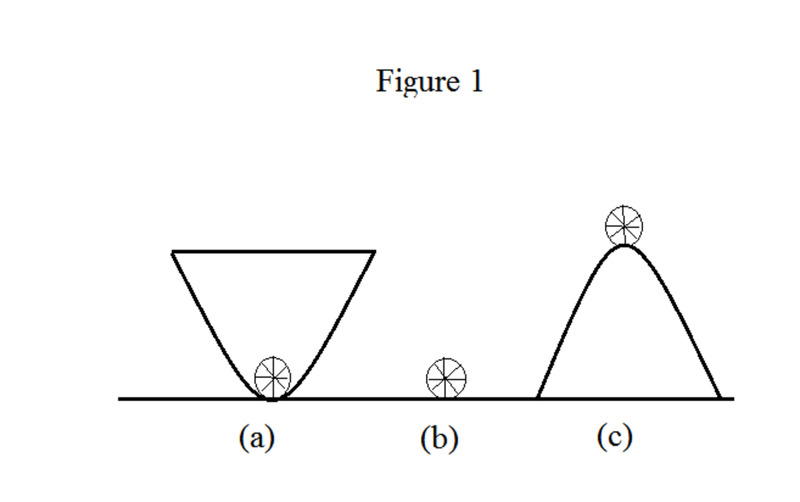 In figure 3, the point E represents equilibrium. OP is the equilibrium price and OM is the equilibrium quantity. If the price goes above the equilibrium price, the quantity demanded is more than the quantity supplied. Because of this excess demand, price goes up further and moves away from equilibrium. Similarly, at prices below equilibrium, quantity supplied is more than quantity demanded. Due to excess supply, price goes down further and continues to move away from the equilibrium. In both the cases, there is no possibility for the price to move towards equilibrium. Hence, E represents an unstable equilibrium position. A second scenario of unstable equilibrium exists while the supply curve is usual and demand curve is positively sloping. Such a demand curve is applicable in the event of ‘giffen goods’. In the instance of giffen goods, demand goes up while the price of the commodity rises and vice versa. 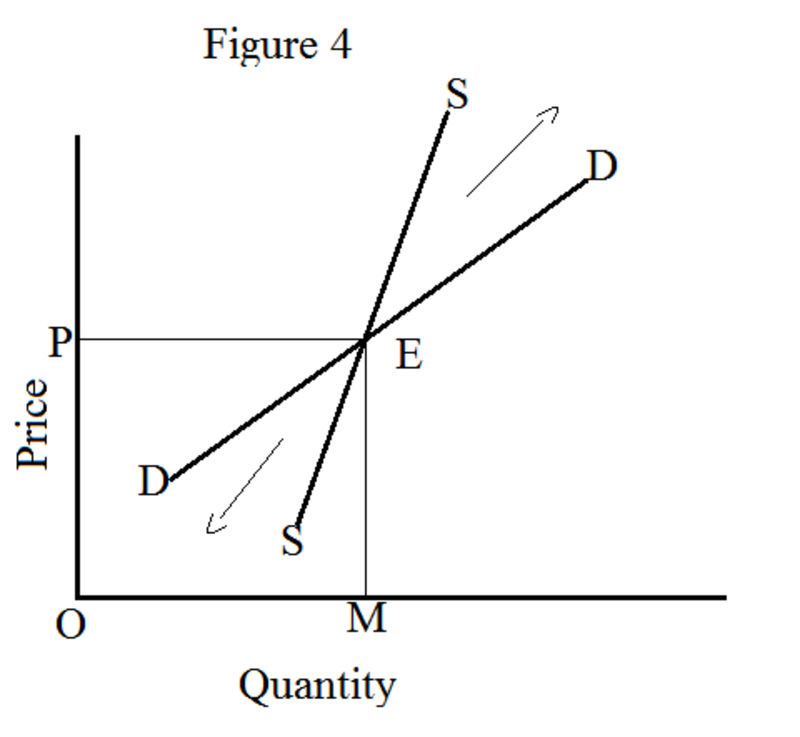 In figure 4, the rare demand curve intersects the regular supply curve at E, which establishes the equilibrium price at OP and the equilibrium quantity at OM. A rise in price above OP causes an excessive amount of demand oversupply. This excess demand over supply provokes another great increase in the price. A reduction in price below OP contributes to excess supply over demand. This excess supply over demand triggers a further decrease in the price. Hence, E in the above diagram is in unstable equilibrium since there is no chance for the original equilibrium to be restored. 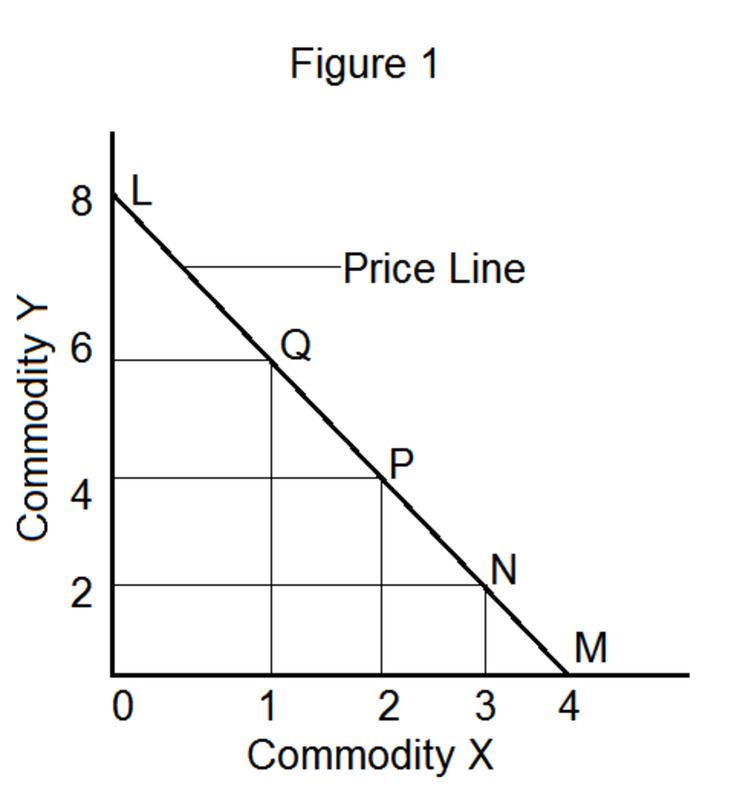 In figure 5(a), demand curve DD and supply curve SS correspond over a range of prices between OP to OP1. OP is the original equilibrium price and OM is the quantity. When the price goes down from OP to OP1, the equilibrium quantity OM stays unchanged. The market is in neutral equilibrium in the EE1 range of prices. 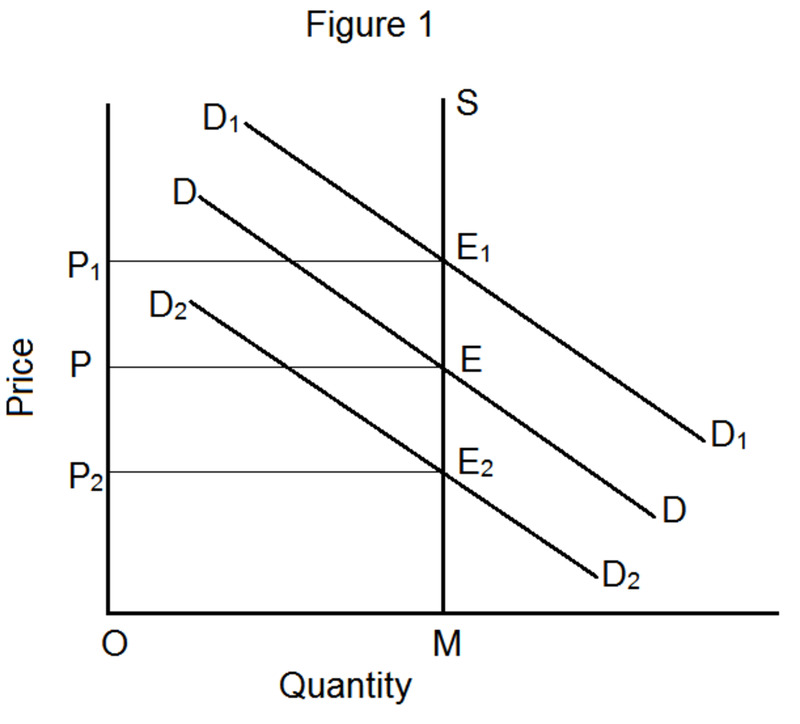 Similarly, the demand curve DD and supply curve SS coincide over the range of output from M to M1 as shown in figure 5(b). A change in demand or supply within the MM1 range of output has no influence to modify the equilibrium price level. 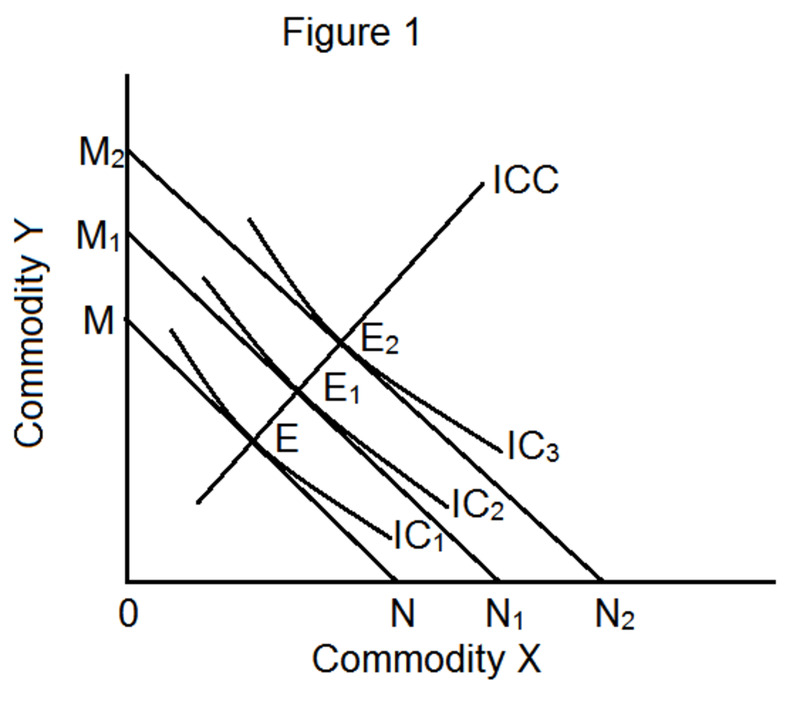 Hence, the equilibrium price is neutral to changes in demand for or supply of commodities within the range of MM1. Why is equilibrium both unstable and stable? Equilibrium formed by positively sloped supply curve and negatively sloped demand curve is a perfect example for stable equilibrium. If a stable equilibrium is disturbed, it will come to its original position after a slight oscillation. Any change in the supply or demand may cause temporary chaos in the equilibrium. However, the restoration of equilibrium does occur in this case. There are occasions in which a market may witness a negatively sloped supply curve or positively sloped demand curve. Equilibrium formed by negatively sloped supply curve and negatively sloped demand curve or positively sloped supply curve and positively sloped demand curve is going to be unstable, which means the equilibrium, if disturbed, will never come to its original position. Though this kind of situation is very rare, we cannot negate the possibility of it completely. 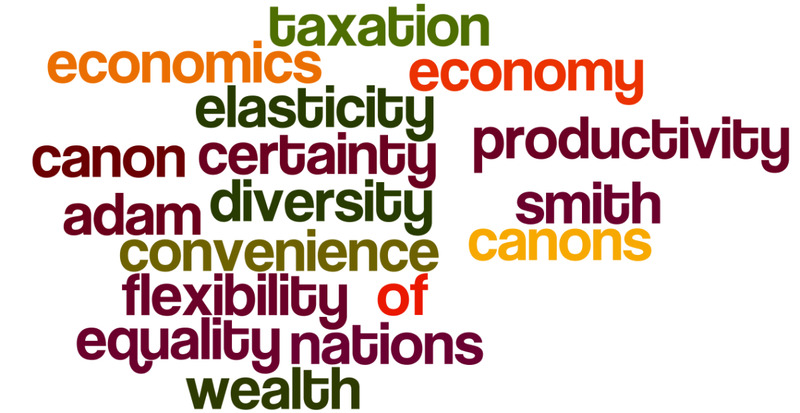 Therefore, we have both stable and unstable equilibrium in economics. Its totally simple and easy to understand. hi Joydev, you are right. But I have explained only stable and unstable equilibrium. just thinking....can the cobweb theorem be used to explain stable and unstable equilibrium i.e the clamped cob web& the explosive with the former depicting a stable equilibrium and the later an unstable equilibrium?